NLDS Game 3: Finally back home, can Giants close out the Nats? Have you started to breathe normally again? Rested those tired bones and weary eyes after 18 innings of intense, pressure packed baseball the other night? Thankfully, the Giants are back home in San Francisco. I don't know about you, but I did not mind a day off yesterday after the longest game in postseason history. It takes a while to soak in a game like that. It's going to go down as one of the greatest games the Giants have ever played. Like all the way back to New York type game. Generally speaking, I don't like extra inning games. The longer it goes, the more guys swing for the fences. Then, when guys do get on, we know a bunt is next and then holding your breath for a base hit. The strategy seems to lessen. But the longer I peeled away at this one I saw the brilliance of Bruce Bochy yet again. If a young manager wants to learn how to use a bullpen in a high pressure game, they need to watch all of this one. From using Sergio Romo in the 9th, to the decision to ride Yusmeiro Petit for 6 innings, every move he made was the right one. It was a managing clinic put on by a future Hall of Fame manager that has 2 World Series rings. The Giants are home with a 2-0 lead in the NLDS against the Nats and Madison Bumgarner set to take the hill. He's the clear ace of the staff, as he showed all season and during the Wild Card game. The players and fans are all happy to see this chance to close out the series. Yes, we all know a team can come back from 0-2, so I don't think anyone has chalked it up as a win quite yet. Before I dive in to some notes about what we may see on the shores of McCovey Cove today, the @SFGiants Twitter account has us all covered so we can all watch the game this afternoon. That was nice of them wasn't it? I'm pretty sure a lot of the Bay Area will be at a standstill as of 2:07 PT. It's a rematch twice over this afternoon between starting pitchers. Doug Fister and Madison Bumgarner faced each other earlier this season, and also during the 2012 World Series when Fister was with the Tigers. But let's be honest, none of that really matters anymore. Bumgarner is pitching like he's possessed by Sandy Koufax right now and Fister has been here before and won't be awed by the big stage. Here's the box scores of those games from Baseball Reference, the Nats won earlier this season and we all know what happened in 2012 against Detroit. There's not much history betweem Bumgarner and the Nats. The good news is Jayson Werth is only 2-for-11 against Bumgarner with 2 K's. Anthony Rendon, the guy with 4 hits and then no hits on Saturday, is 3-for-5 lifetime against Bumgarner. The only HR any of the Nats have hit against him came off the bat of Bryce Harper. Overall Harper is 3-for-9 against Bum. 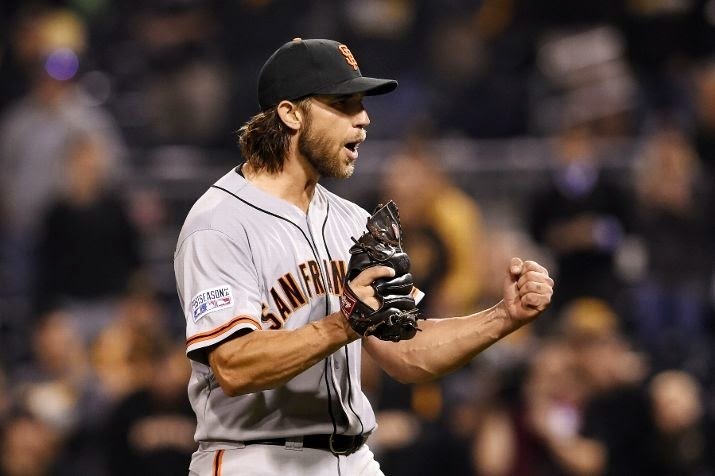 After that shutout in the Wild Card game Bumgarner now has 16-straight scoreless innings pitched in the postseason. Not including the playoffs, no Giants batter has faced Fister more than 6 times. Amazingly, Joe Panik is 3-for-3 against Fister and hit his only career HR against him in Washington back on August 22nd. That day the Giants managed 4 runs in 7 innings against Fister. Three of the runs were on Panik's HR and the other was a solo shot from Buster Posey. Speaking of Posey, he's 6-for-15 so far in this year's playoffs. He's hit safely in each game and all 6 hits have been singles. I'm hoping he connects for something solid this afternoon and at least drives one to a gap. You may have heard that Pablo Sandoval is on a postseason hitting streak. It's up to 13 games and is now 2 short of Marquis Girssom's NL record 15-game streak. Sandoval's streak is the longest in franchise history. He only managed 1 hit in 7 at-bats during that epic game on Saturday but he made it count by driving in Panik. Once again Gregor Blanco is leading off. It's really quite something that the Giants have won without any real contribution from Blanco. If the Giants get past the Nats I have to wonder if Bochy changes the lineup. Blanco's had 1 hit in the 3 games the Giants have played. Yikes. Things look pretty good for the Giants to end this series today. Joe Panik is doing things at the top and the 3-7 hitters have all contributed. If Madison Bumgarner does his job then the Giants will be celebrating. If not, well there's more baseball to be played. The Giants get 3 cracks at this, let's hope they end it today.